The 1 starts the offense at the top of the 3 pt arc. 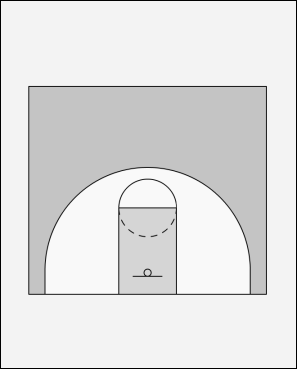 2 is on the wing, outside of 3 pt arc. 3 and 5 are in a stack on the block, with 3 above 5. 4 is on the opposite block. If 2 is open, he shoots the ball. If he is not, then he says "break", telling the 3 and 5 to break, with 3 going into the corner, outside the 3 pt arc, and 5 going up to the elbow. If 5 is open, 2 hits 5 with pass. 5 looks to shoot, or pass down to 4 on the opposite block. If 5 is not open, 2 passes the ball to 3 in the corner. If 3 is open, he shoots. If 3 cannot shoot, he looks for the double team. If 3 is double teamed, he looks to hit 2 cutting to basket. If he cannot hit 2 cutting, he looks for 5 rolling to the basket, or posting up on the block. 2 continues through key, and sets up on opposite wing. 1 replaces 2 on ball-side wing. If 5 is open, 3 hits 5 with pass, and 5 makes the basket. If 3 cannot shoot, or pass to 2 or 5, he passes back out to 1, who has replaced 2 on the wing. 1 then who dribbles to the top of key. As 1 dribbles to top, 3 runs baseline and re-sets in stack with 4. Play then re-sets from this side of floor.